Right from the start, WITTMANN Kunststoffgeräte GmbH saw the pursuit of innovation as an unconditional guiding principle. The company’s choice of motto – “world of innovation” – clearly illustrates this philosophy. Countless patents testify to pioneering approaches in such diverse fields as robotics, temperature control, drying, dosing and conveying. Innovations from WITTMANN are helping users significantly increase efficiency, which brings decisive benefits in production. With this progressive approach to product development and the manufacturing process, WITTMANN has been able to hold its own against all of the minor and major fluctuations in the plastics processing machinery market over the past several years. In the current year 2013, WITTMANN Kunststoffgeräte GmbH is once again on course to break its earlier records. 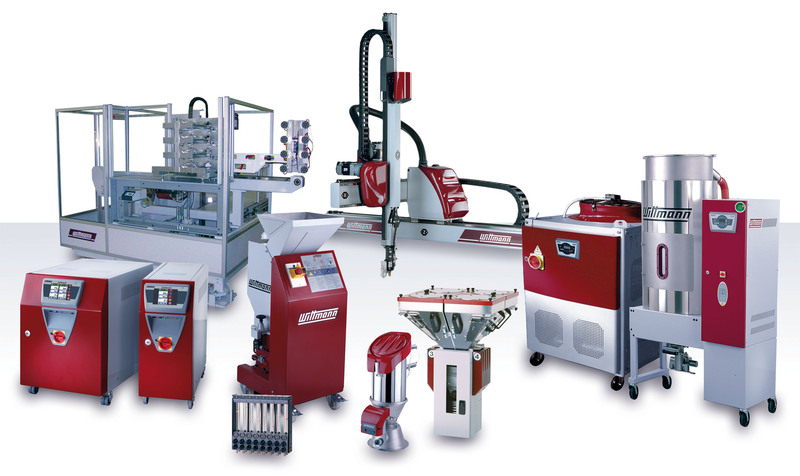 This trend is based on a strong need for automation in the plastics industry and on the uninterrupted demand for innovative peripheral equipment. The objective of 275 million euros in sales for the current year announced by the companies of the WITTMANN Group will be to achieve. Again, this represents a growth compared to the previous year. That growth also justifies the expansion of numerous subsidiaries of the WITTMANN Group throughout the world.At the start of the year, the German company WITTMANN Robot Systeme GmbH moved into its newly erected manufacturing facilities in Nuremberg. The company has now tripled the amount of space it has available for assembling automation systems. As a result, the facility in Nuremberg is now able to build, test and release complete machines which consist of WITTMANN BATTENFELD machines with closing forces of up to 500 t and the associated automation systems. Shortly after having moved to the new Nuremberg facilities in February 2013, the main site for robots and peripheral equipment in Vienna, Austria, was expanded by one third with a plant specializing in sheet metal processing. That site manufactures components used in the areas of conveying and dosing technology.The US headquarters of the WITTMANN Group in Torrington, Connecticut, is also undergoing a major expansion at this time. The next expansion of the just recently completed works in Querétaro, Mexico, is already on the drawing boards.And the expansion of the Taiwanese works in Taichung is also underway.In addition to those construction activities, two new companies within the WITTMANN Group were also founded in May and June of this year. The subsidiary in Jakarta, which will develop the Indonesian market, was established along with one in El Paso, Texas. The latter provides optimal support to so-called “maquiladoras” – the manufacturing operations in the free-trade zone along the border between the USA and Mexico. The longstanding trend toward the increased use of automation systems is supporting innovations in the area of WITTMANN robots. Not one but two models were recently added to the product portfolio: The new models W822 and W842 are especially well-suited for executing complex automation and insertion processes. The use of heavy grippers means that they can also handle higher loads. At this year’s K in Düsseldorf, the new robot series W8 pro will be presented, which differs from its predecessor in terms of both looks and performance specifications. At the K 2013 trade fair, WITTMANN is presenting the W8 pro generation of robots, the advanced version of the W8 robot series which has already proven itself thousands of times over. The professional public in Düsseldorf will have the chance to see the first model series of this new generation, the model W833 pro. 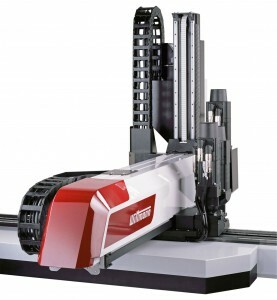 Consistent application of lightweight construction technology for the axes in combination with the drive concept WITTMANN developed especially for linear robots make the models of the W8 pro series extremely dynamic while maintaining extraordinarily low energy consumption at the same time. The resulting minimal use of moving lines for energy transmission and interconnection further extends the service life of the equipment.The functional scope of the high performance R8 IPC robot control system has also recently been expanded, and will appear at K 2013 in the version R8.3. .Presented in the version R8.3, the current evolution places particular emphasis on user-friendly operation along with easy communication and interaction with the injection molding unit. It was also designed to be as straightforward as possible for new users to learn to operate. For that reason, the text editor which has proven effective for many years now was retained, but is now assisted by a powerful, graphics-based programming aid. And of course the other well-established intelligent functions of the R8 control system can also be called up: EcoMode for automatically setting the speed of travel, SmartRemoval to reduce removal time, Automatic Collision Detection to protect mechanical components while teaching and SoftTorque for secure transfer of parts. At the K 2013 trade fair in Düsseldorf, WITTMANN is presenting the latest model from its line of FLOWCON flow regulators: the FLOWCON plus with proportionally controlled stepper motor and wear-free flow meter. By replacing the solenoid valves of the previous model, this enables proportional control of the valves, which allows for a significant improvement in temperature control. The valves of the FLOWCON plus can be used both as simple control valves with flow monitoring and in combination with a temperature probe to regulate mold temperature.The maximum equipment configuration of the FLOWCON plus features 4 × 12 cooling circuits, which are connected to one another via a data cable.
. The area of extrusion opens up further possibilities for the TEMPRO plus D-2-L. But ultimately a temperature controller with significantly larger dimensions was mainly needed in order to be able to offer a temperature control system which is also suitable for large machines – not least as part of any operating environment which includes a MacroPower injection molding machine from WITTMANN BATTENFELD. 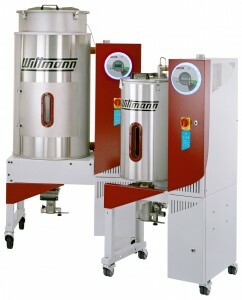 Directly cooled temperature controllers are suitable for all plastics processing applications where both high cooling performance and high heating capacity (for a quick heating-up of the mold) are both required.WITTMANN’s new models of the TEMPRO basic C120 series present much-reduced dimensions, including a compact appearance and a much smaller factory floor ‘footprint’. Just as with the TEMPRO primus C120, the appeal of the systems in the TEMPRO basic C120 line lies in their compact construction and the versatile choice of primary technical components: the pump (0.75 kW – 200 l/min – 2.35 bar or 1.5 kW – 200 l/min – 3.65 bar), the heating capacity (9 kW or 18 kW ) and the cooling valves (⅜” or ½”). 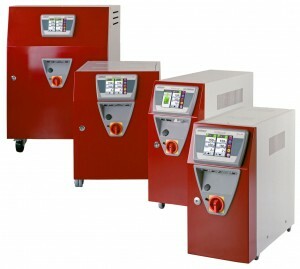 TEMPRO basic C120 temperature controllers are also available in a somewhat larger version. In that case their pump size can be configured in the same way as the TEMPRO direct C120, whereby the pump capacities then range from 0.75 kW to 4 kW. The standard heating capacity of 9 kW can also be increased to 18 kW as an option. And the available choice of cooling valves (⅜”, ½”, ¾”) makes it possible to adjust cooling capacities in fine increments.WITTMANN very clearly stands out among its competitors in this equipment sector once again, because as a special highlight – besides pumps with capacities of 2.2 kW and 4 kW – it ultimately offers equipment options which enable heating capacities of 36 kW and even 46 kW. The new DRYMAX Aton2 F30 makes its debut at K 2013 as the third model of the innovative WITTMANN segmented wheel dryer series. The first two segmented wheel dryers with dry air volumes of 70 m³ and 120 m³ have enjoyed enthusiastic market acceptance. Now the new model F30 with a capacity of 30 m³ is also available.The DRYMAX Aton2 F30 is designed to dry material at a rate of 20 kg/h.The DRYMAX Aton2 F30 can save up to 40% of the energy consumed by other drying wheel technologies, and in addition it maintains a constant dew point of as low as -65 °C. Central or battery dryers with frequency-controlled blowers for performance-based operation are nothing new. However, WITTMANN now presents the decisive innovation in this area with the DRYMAX E FC, the first such dryer in which the drying air volume automatically adjusts to meet changing requirements. The need to enter the material consumption into the control panel manually in order to adjust dryer output is now a thing of the past. Whether the output of the dryer blower needs to be increased or decreased is determined here by the suspension pressure in the collection air lines. Along with the dew point, the dryer’s display also indicates the current blower frequency. From a larger perspective, the frequency-controlled air output adjustment now also offers a new means of making more effective use of emergency or replacement dryer systems. No personnel are needed anymore to switch dryers or to connect dryers; the corresponding processes are set in motion by the intelligent DRYMAX control system. 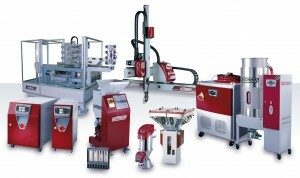 The demands placed on plastics processors today are constantly changing. And when production operations grow, they may need larger molds, which are often accompanied by higher rates of material consumption. The operating limits of existing dosing units is soon reached, and the corresponding investment can hardly be avoided any longer. The new control system of the GRAVIMAX G dosing unit model series offer a previously unknown function for so-called “parallel dosing”. This enables up to 30% higher throughput without having to make mechanical modifications to the equipment itself. 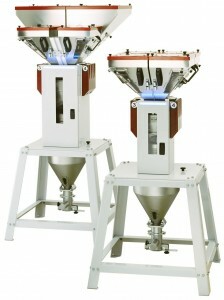 Simultaneous operation of multiple dosing valves and the resulting increase in material flow make this possible. As with the previous models, RTLS Technology (real time weighing) ensures accurate dosing. Throughout the entire dosing cycle, two weighing cells are active. They perform exact measurements with accuracy to a tenth of a gram and guarantee consistent shot-to-shot part quality. The LED display (known as ambiLED) on the front of the unit clearly indicates the system’s mode of operation at any given point in time. The dosing weight, the progress of dosing operation, and the remaining quantity to be dosed can be read in % or kg at all times from the color display of the new handheld control unit – whereby the graphic presentation of the user interface is based on that of the WITTMANN temperature control units. For the first time, the FEEDMAX S3 net from WITTMANN now combines the advantages of single conveying units with those of a centralized control system. Using a CAN bus, several FEEDMAX S3 net conveyor units can be linked together and controlled from a single console. WITTMANN provides a high-resolution 4.3″ TFT touch screen for this purpose, which displays complete information about the status of each separate unit. The information is processed graphically for display on the screen, in order to make operation as easy as possible. As standard equipment, the FEEDMAX S3 net features an LED status display which is easily visible even from a distance and thereby promotes production reliability. This LED display was first introduced with the Aton segmented wheel dryer. 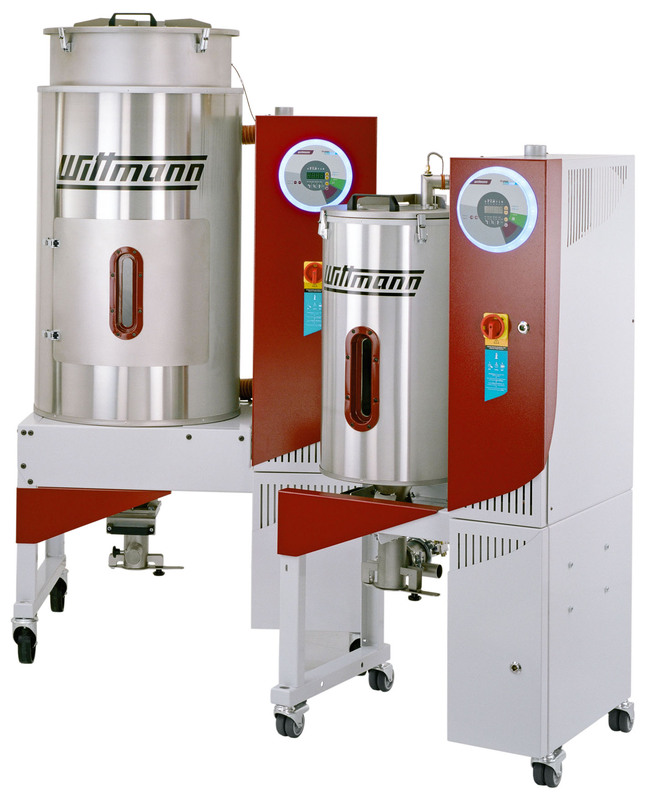 Meanwhile the principle has become a kind of trademark for the new developments from WITTMANN in the areas of material drying, dosing and conveying. With its powerful 1,100 W motor, the FEEDMAX S3 net has become a real powerhouse. It is designed for conveying up to 200 kg/h. A micro-fiber filter made of polyester and its automatic cleaning system prevent power reduction when processing dust-laden materials. Made entirely of stainless steel, the unit can also be fitted with an optional 2-component diverter which enables it to convey both new product and regrind. For even more power or to overcome greater conveyor distances, a variant with a central vacuum generator is also available: the FEEDMAX BS net. In various size models, the FEEDMAX BS net can be combined with blowers of up to 7,500 W.